This simple wine marinade gives your steak a robust, boisterous flavour: a little like game, curiously. Serve with a quick anchovy butter, smothered on hot toast, ideally a sourdough or crusty, country-style loaf. 1. Put the steaks in a large bowl with the onion, garlic and chilli powder; season. Pour over the wine, ensuring the meat is covered. Cover with cling film and chill for at least 4 hours, preferably overnight. 2. For the anchovy butter, beat the anchovies, garlic and butter until smooth, creamy and fawn-coloured, then season to taste. 3. To cook the steaks, discard the marinade and pat the steaks completely dry on kitchen paper. Season, coat with the oil and cook on a hot barbecue (or griddle pan) for about 4-6 minutes, turning regularly, until cooked to your liking. Rest under a sheet of foil while you toast the bread. 4. 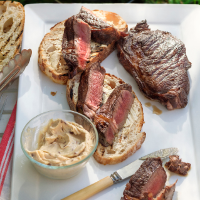 Spread the toast with anchovy butter and slice the steaks to serve alongside.